Deep-fried, crispy, and with that unmistakable aroma — at first bite, a true Buffalo wing bites back with a kick of Frank’s Red Hot. Born in Buffalo in 1964, and made of nothing more than chicken coated in Frank’s Red Hot and butter, the traditional recipe is on menus everywhere. 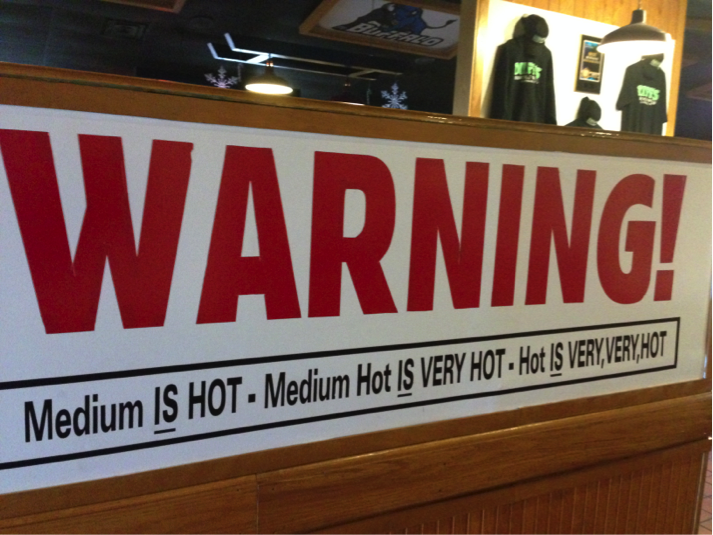 Yet Buffalo wings come in more varieties than mild, medium, or hot. Local chefs are several years into revamping the dish, experimenting with a number of flavors and cooking techniques that both enhance the city’s wing culture and rival other wing trends nationwide. As a Buffalonian with a life-long love of the traditional recipe, I teamed up with Drew Cerza, Buffalo’s “Wing King” and founder of the National Wing Festival, to investigate the wing boom. As the city’s resident wing expert and part-time celebrity, the entrepreneur has spent a dozen years eating his way through the city’s wings and promoting the dish across the country. 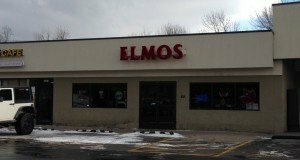 We met first at Elmo’s, a suburban beer and wing joint located in an unassuming strip mall near the University at Buffalo’s Amherst campus. Presently one of his favorite undiscovered spots, Cerza is ready to give Elmo’s their first invitation to the Wing Festival thanks to their attention to flavor and their grilling technique. “I like a barbeque finish on the grill. It’s another step and a lot of effort but it’s worth it,” says Cerza, gnawing the meat off the bone of a Cajun barbeque wing. Starting as an experiment a few years back between Elmo’s two chefs, the wings are dipped separately in Cajun and barbeque seasoning, deep-fried, and then grilled twice. Adding a char flavor and caramelizing the sauce, grilling helps combine “the sweet with the heat,” he says, a flavor craze that Cerza has noticed increasing in intensity over about the last five years. 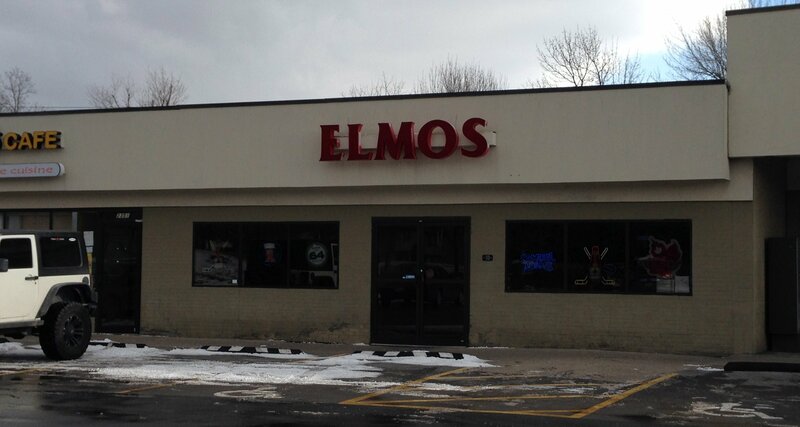 If you live in Buffalo over time, you come to develop a discerning palate for good versus mediocre wings. Cerza takes it to the next level, looking to detect any doctoring of the Frank’s original sauce. “Is it Frank’s? Is it not Frank’s?” he asked as he tore through the double-boned wings known as flats. There certainly was some enhancement to Elmo’s traditional recipe. In a furtive manner, the waitress confirmed it was Frank’s with some secret additions. Appropriately crispy and not too saucy, the hot wings are simply deep-fried and not finished on the grill. After Elmo’s, we meandered to Amherst Pizza and Ale House, another strip mall establishment a few minutes drive from the University. But despite adding “Original Hot,” garlic-Parmesan, and a more generic barbeque recipe to our wing-a-thon, the experience here was just average. Maybe it was a deep-fried fatigue, or the midday buzz from my second beer setting in. Crispy, buttery, and doused in cheese, the garlic-Parm wings were hot and handy comfort food that quickly lost its luster when the meat cooled. “I question how much people order them,” Cerza says of the variety. 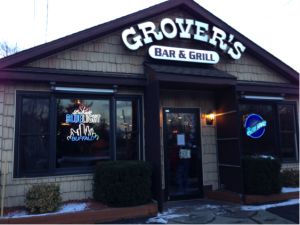 After talking chicken for a good three hours, we made our way to Grover’s, another Amherst bar and grill made famous after Guy Fieri ate their cheeseburger soup on Diners, Drive-ins, and Dives. Ordering “Original Hot,” “Thai Sweet Chili,” and the “Backward Bleu” variety, I found my second wind at our third restaurant. Traditional chicken wings have the hot sauce on the chicken and the bleu cheese on the side (if it’s ranch, you know you’re eating an imposter). Grover’s “Backward Bleu” flipped the recipe, tossing the wings in bleu cheese and serving them with a side of hot sauce. Looking a little bit like they were dipped in curdled milk, the creamy wings were a little too much of a departure from the crispy texture I’ve come to prefer. The Thai wings had that “sweet with the heat” flavor, but they were too saucy for my tastes. Unlike Cerza, my fat-processing organs could only take two-dozen wings in a day (and even that was pushing it). We parted ways and I made separate trips to the Anchor Bar and Duff’s, the two Buffalo restaurants most famous for their wings. The mother of all chicken joints, the Anchor Bar does not disappoint. The medium wings are crispy with just enough spice, making for a baseline flavor by which I could compare other restaurants in the city. 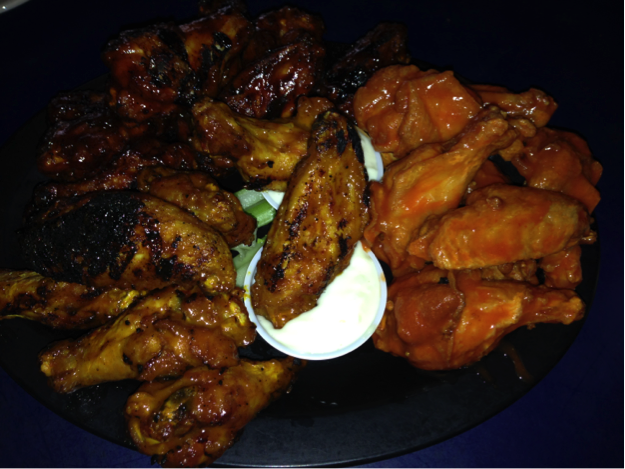 Duff’s too gets the job done, and the saucier finish on their wings makes them a departure from the original. If you’re up for torturing your tongue and obliterating your olfactory senses, then order the “Suicidal” or “Death” sauce, spicy options that nearly made this grown woman cry. 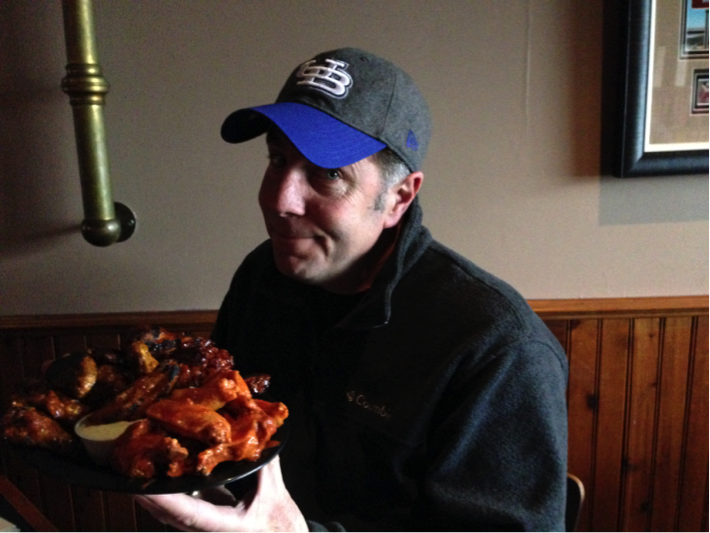 Five restaurants, three days, and one visit with the Wing King later, my chicken chomping still felt incomplete. So to avoid further indigestion, I took to social media to conduct a very unscientific poll on the wing preferences of Buffalonians. Forty-one people responded (nearly all strangers), many of whom voted more than once. An inherently imperfect data collection process, my survey proved three things: you can get wings everywhere, it’s nearly impossible to try them all, and flavor preference goes far beyond the original recipe. Locals mentioned twenty-eight different spots, with just seven restaurants mentioned more than once. Bar Bill by far was most preferred, with the majority of people over the moon for their homemade Original sauce. It’s garlicky, sour, and tangy, while still remaining spicy, tweeted Donnie Burtless, a Buffalonian and founder of the Buffalo Eats blog. Spicy, deep-fried, and unbreaded — the majority of respondents still like the traditional recipe, and they like them hot. Cerza too agrees. “I never eat a medium wing anymore,” he says. 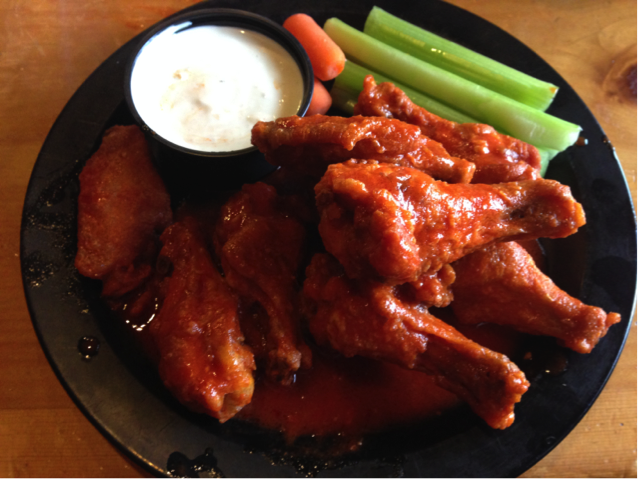 “It just doesn’t do it for me.” The Anchor Bar and Duff’s may be the first restaurants to roll off the tongue, but Bar Bill and Gabriel’s Gate confirm there are great wings in more than a few well-known spots. Cerza isn’t the only Buffalonian with a taste for grill char and barbeque flavor; in fact, several respondents in my social media survey expressed the same sentiment. Also, vegetarian eggplant “wings” were mentioned enough to make me consider a nonmeat alternative. Kubiak was one of those chefs, and in early 2014 he designed 716’s wing choices so that they incorporated flavors indigenous to Buffalo but “with a twist.” Like Grover’s and their Backward Bleu wings, 716’s Chicken on Weck recipe fuses the chicken wing with another food indigenous to Buffalo: the Beef on Weck, a roast beef sandwich with a side of horseradish on a kimmelweck roll (a bun with kosher salt and caraway seeds). An overabundance of dried horseradish kindled the idea to use Beef on Weck seasonings on the chicken wing. When testing the recipe, “I put it in front of people and everybody was blown away by it,” says Kubiak. The restaurant was voted a Festival Favorite at the 2014 National Wing Festival, and the Chicken on Weck wings are the restaurant’s third best-selling recipe behind their classic and signature recipes. Wildly popular and wonderfully indulgent, at least half a dozen chickens are needed to make even a small order of wings. And though the urban farm movement is growing in Rust Belt cities like Buffalo, wings remain invariably tied to the large-scale operations that created the opportunity for the dish’s invention in the first place. In the twentieth century, chicken farming in America went from a backyard operation to the world’s largest poultry producer, according to the USDA. And since the 1950’s, we’ve been eating chickens which are bred to “grow quickly and with minimal feed,” according to a recent op-ed in the New York Times. 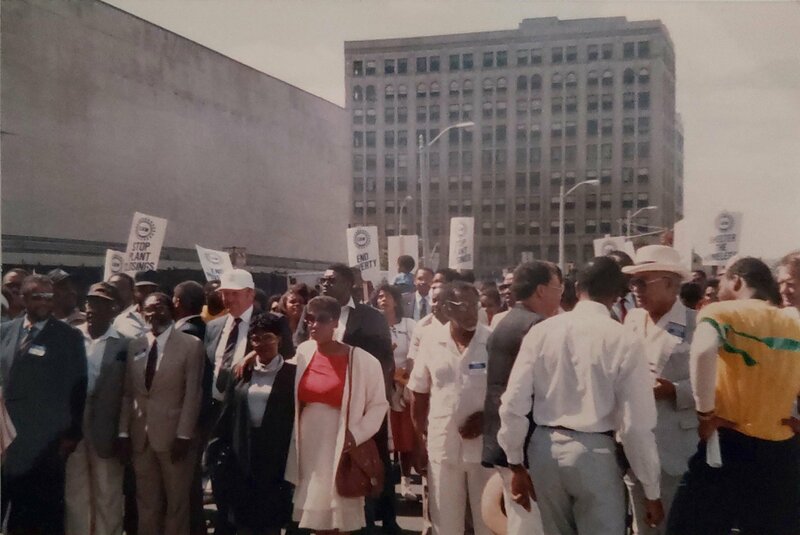 When the Anchor Bar’s proprietor Teressa Bellissimo invented her chicken wing recipe in 1964, wings were cheap. And unwanted. “The wing was always kind of a byproduct,” says Tom Super, a spokesperson for the National Chicken Council. Back then the birds’ wings “were virtually thrown away,” he says. Also in 1965, one year after the invention of the recipe, Americans ate about half as much chicken as they eat today. Then, we ate on average almost 34 pounds of chicken per year, compared to more than 50 pounds of pork and 75 pounds of beef, according to the USDA. Soon thereafter, a number of factors shifted the American diet: the low-fat craze, the explosion of the packaged food industry, and simply, changes in food preference. The USDA writes that “after 1977 chicken marketers emphasized the lower saturated fat content” in chicken relative to beef or pork. And “in the 1980’s Americans really turned to boneless skinless chicken breast as what they preferred,” says Super. The popularity of chicken wings undeniably played a role in America’s increased poultry consumption over time. The Chicken Council considers 1990 the year wings went national, with McDonald’s putting them on their menu. KFC followed in 1991 and Domino’s in 1994, further enhancing the wing’s reach. And while they may not have been authentically Buffalo or even great tasting, they did loads for publicizing the dish and the city, says Cerza. Today, wings are as ubiquitous as French Fries or Coca-Cola, in Buffalo and beyond. American farmers produce 8.5 billion chickens each year, and two thirds of their wings end up in the food service industry, including restaurants, says Super. And while we ate an average of 34 pounds fifty years back, in 2015, we’re expected to eat an average of 87 pounds of chicken per person per year. The Mid-Atlantic states (including New York and Pennsylvania) eat the most wings, followed by the South Atlantic states and East North Central part of the country, which includes Michigan, Ohio, Illinois, Indiana, and Wisconsin. 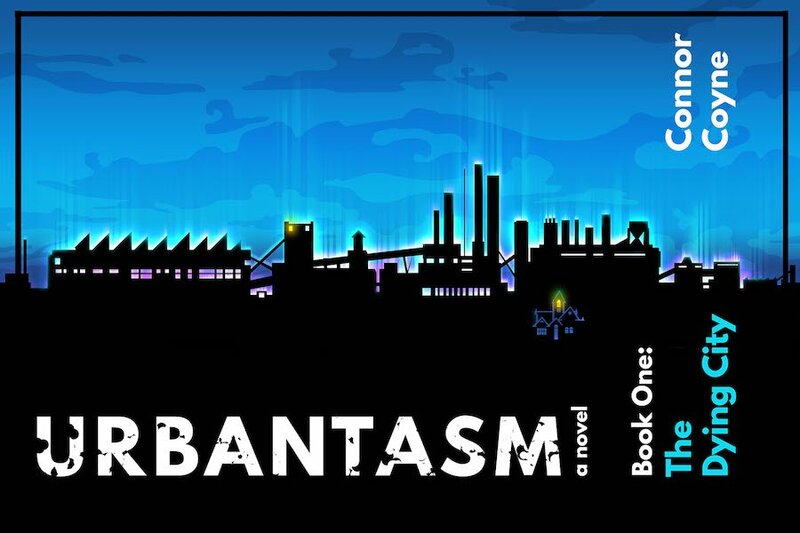 [blocktext align=”right”]“We’re lucky to have a food that is so internationally recognized be so synonymous with our city.”[/blocktext]In the Rust Belt, if you’re having chicken wings there’s a good chance they came from Pennsylvania or Ohio,” says Super. The states rank fourteenth and fifteenth in chicken production in the U.S. respectively, according to Super. The Super Bowl, of course, is prime time for the dish. This year, the Chicken Council estimates we’ll eat 1.25 billion wing segments (meaning the drumsticks and the flat, or bony, pieces). When it comes to Buffalo, local organizations like Visit Buffalo Niagara, which promotes regional tourism, can’t even accurately count the number of restaurants that serve wings in the metro area, which has a population of a little over one million. “Chicken wings act as a great hook to bring people to Buffalo,” says Brian Hayden, a communications manager at Visit Buffalo Niagara, and wings make an significant contribution to the local economy, he says. “We’re lucky to have a food that is so internationally recognized be so synonymous with our city,” he says. 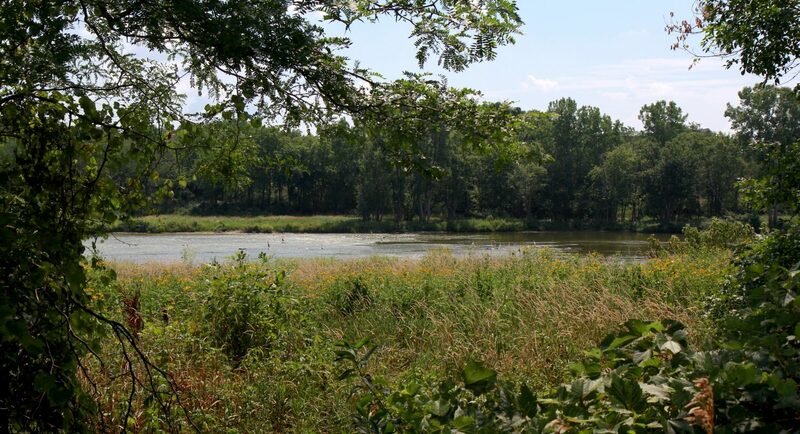 “What’s a food that’s indigenous to the character of Buffalonians? It’s the chicken wing,” says Cerza. Support paywall free, independent Rust Belt journalism – and become part of a growing community – by becoming a member of Belt. 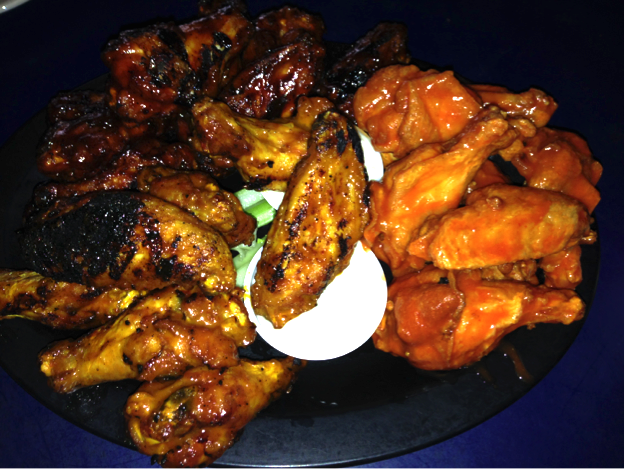 I’ve been to all the wing joints in your poll, but what does DBGB stand for? 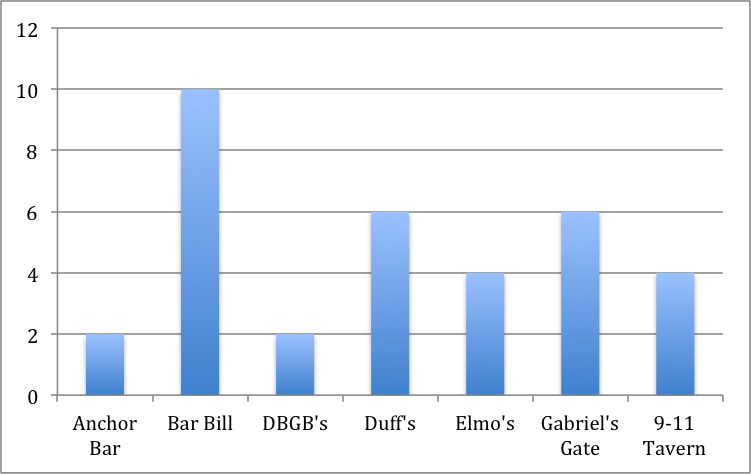 DBGB in the bar graph is an abbreviation of Duke’s Bohemian Grove Bar (253 Allen St., Buffalo, NY).